Full range of products for cleaning and degreasing screen printing meshes prior to stencil making. For detailed technical information and material safety data. Please contact us on 01942 888747. Also available: KIWO Clean Line Chemicals for use in Automatic Degreasing Units. Ask for Details. Ready-to-use liquid for degreasing, preparation, giving improved wetting and antistatic supportof screen printing meshes. 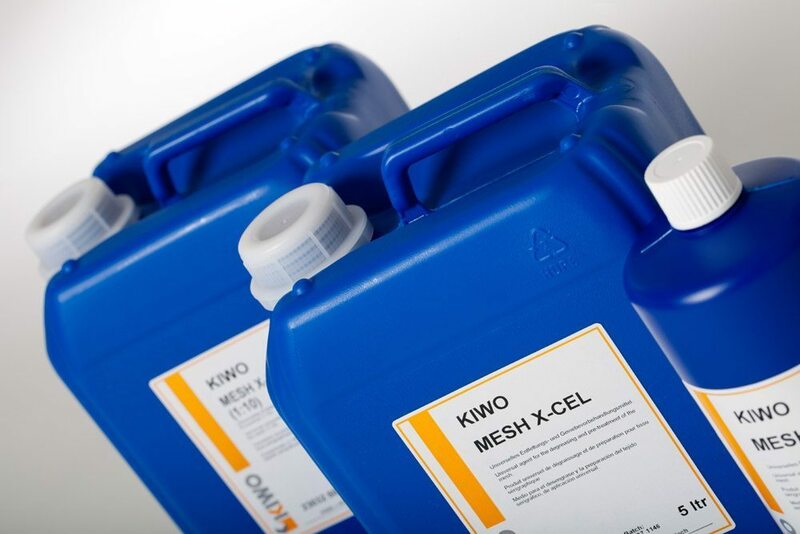 KIWO MESH X-CEL is a highly efficient screen mesh preparation which improves the coating properties of direct emulsions and the water transference of indirect and direct stencil making films (e.g. KIWOFILMrange) decisively. KIWO MESH X-CEL also acts as a degreaser and wetting agent, making it a universal agent for mesh pre-treatment. Furthermore, KIWO MESH X CEL has an antistatic action. Screens ,prepared with KIWO MESH X-CEL do not show the typical problems associated with static electricity,such as spattering of the ink during printing. Due to the improved adhesion of the emulsion to the mesh, KIWO MESH X-CEL also produces a higher resistance to long print runs, better printing properties of the ink and therefore a high quality print. Ready-to-use liquid for degreasing, preparation, giving improved wetting and antistatic support of screen printing meshes. Liquid concentrate for degreasing and pre-treatment of screen printing stencils. Improves the flow properties of emulsions and reduces electrostatic charge of the mesh. 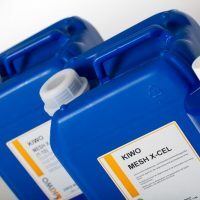 KIWO MESH X-CEL K 10 is a concentrated, highly efficient screen mesh preparation which decisively improves the coating properties of direct emulsions and the water transference of indirect and direct screen printing films (e.g. KIWOFILM products) after the dilution of 1:10 with water. KIWO MESH X-CEL K 10 solutions also act as degreaser and wetting agent, making it a universal agent for mesh pretreatment. Furthermore, KIWO MESH X-CEL K 10 has an antistatic action. Screens, prepared with KIWO MESH X-CEL K 10 do not show the typical problems associated with static electricity, such as spattering of the ink when printing on plastic substrates. Due to the improved adhesion of the emulsion to the mesh, KIWO MESH X-CEL K 10 also produces a higher resistance to long print runs, better printing properties of the ink and therefore a high quality print. KIWO MESH X-CEL K 10 can also be used in automatic cleaning/ decreasing units. 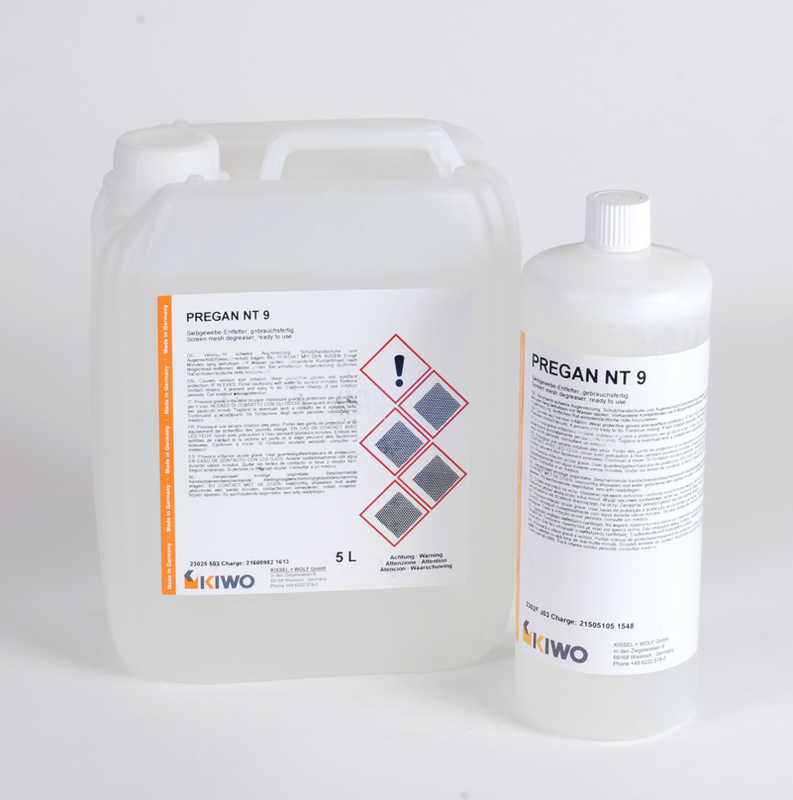 PREGAN NT 9 is a highly efficient cleaning and degreasing agent for all types of screen meshes. It prevents the appearance of pinholes and surface deterioration when coating with direct emulsions. Economical application and optimum distribution even on course meshes due to its viscous consistency. In its formulation mainly components which are either made of renewable raw materials or produced biotechnically were used. PREGAN NT 9 is pH-neutral, free from phosphates and chlorides and easily biodegradable. 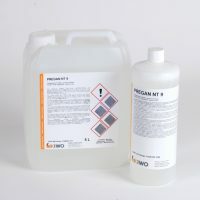 PREGAN A 9 EXTRA screen mesh cleaner is a highly efficient cleaning and degreasing agent for all mesh types. It prevents the appearance of pinholes and surface deterioration when coating with direct emulsions. Its formulation has especially been adapted to meet with the requirements of screen printing. PREGAN A 9 EXTRA is therefore better than all conventional detergents. Economical application and optimum distribution even on coarse meshes due to its thick consistency. PREGAN A 9 EXTRA is biodegradable and can be emptied into drains in usual working dilution. PREGAN NT 9 K is a highly efficient screen cleaning and degreasing concentrate for screen meshes. It is used in a dilution of 1:10 with water. PREGAN NT 9 K solutions emulsify contamination and fats and thus make them water soluble. Its formulation has especially been adapted to meet with the requirements of screen printing. PREGAN NT 9 K is therefore better than all conventional detergents. It is suitable for all mesh types and prevents the appearance of pinholes and surface deterioration when coating with direct photo emulsions. In its formulation mainly components which are either made of renewable raw materials or produced biotechnically were used. PREGAN NT 9 K is pH-neutral, free from phosphates and chlorides and is easily biodegradable.